Las Vegas leaders are beginning a push to build a new sports arena and performing arts center in the city. The charge is being led by Steve Wynn, owner of the Golden Nugget and other casinos. Wynn held a conference at his Bellagio hotel and casino to push the idea to 75 other community leaders. Wynn said he was not interested in financing the venue, but wants to promote the idea as a way of making the city better as a tourist destination. A poll of local residents found a strong desire for sports entertainment, with 93% supporting an arena and 87% supporting a performing arts center if tax money is not used. Support drops to 66% for the arena and 61% for the performing arts center if tax money is involved. Wynn says he believes the city should work to attract an NBA and an NHL franchise for the arena to help offset its cost. Las Vegas officials have been quietly shopping around for a Major League Baseball franchise. It is already the host of the Las Vegas Stars, a Triple-A team. 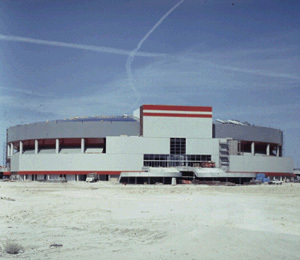 The IHL Las Vegas Thunder also plays in the city at the Thomas and Mack Center, an arena owned by the University of Nevada, Las Vegas. The venue was recently renovated and work is now being done on Sam Boyd Stadium, the university's football venue.